There is a huge variety of these icons to improve your website designs. To make your work easy I have collected an exciting range of these social media icons. Use these icons for your website/blog. All I can say is that these social media icons will wow the visitor into bookmarking your website leading to more traffic. So enjoy viewing and downloading your favorite icon sets from the collection. This free icon set, by PSDDude, consists of 14 icons for major social media networks, as well as common content-sharing icons like an RSS feed icon and an email icon. Because these icons look good on a light or dark background, you can integrate them easily with your website. You can also create your own stamps by using the provided PSD template. Here are beautiful 18 free Ribbon social media icons set that can become a part and parcel of light shaded or white background websites. It’s the time to make your sites look more beautiful, attractive and communicating as well. These icons are shaped in the form of water droplets hence the name Social Drops. They are available in 3 different sizes (16×16, 32×32, 64×64), and free for any type of use. The set includes 16 icons in three different sizes, namely: 16 icons 128x128px, 48x48px 16 icons, 16 icons 16x16px. A set of colorful, flat-designed icons for 30 major social media networks, including Facebook, LinkedIn, Google Plus, MySpace, Vimeo, YouTube, Tumblr, and more. The set works great with both bright- and dark-color background. Handy is a set of 24 free and exclusive vector icons that can be used on websites, logos and more. The icons have a unique hand drawn feeling and look great in color or black and white. These are a set of 40 social media icons inspired by Google new visual style. Each icon comes in 4 different sizes(32×32 px, 64×64 px, 128×128 px, 256×256 px) and is optimized to align perfectly on pixel grid. You can use these icons for free in all your personal and commercial projects. These are a set of 24 social media icons on wood texture. The icons come in fully-editable PSD and PNG formats with the PNG files in two versions of shadow and non-shadow icons. This is amazing set of 15 free social media icons.Very nice and modern, and can be used on any color background. There is both PSD file and transparent PNGs of the icons. The PNG icons come on a 72×72 pixels background. These icons are minimal and simple encompassing the flat design trend. This set of 45 social media icons come in vector .ai and .eps formats for download so that you can easily change the colors of them to match your design. Sketchy is a colorful icon set for all major social media and frequent used blogging platforms, including Facebook, LinkedIn, Blogger, Flickr, Google Plus, MySpace, Vimeo, YouTube, Reddit, Vimeo, Yahoo!, RSS, and more. These social media icons can be used in ladylike, feminine and girly blogs/ websites. The websites having girly cute themes and blogs having adorable backgrounds can make use of these cute social media icons. These will emerge in the backdrop and very aptly play their destined role in your blogs/websites. The icons come in PNG format so you can easily change their color, add textures and fade or blend them. They are each 50×50 in size. This icon set includes 20 stained social media icons for use in your grungy site designs. This set contains eight social icons plus one RSS icon. The Icons are available in Following Formats. .AI, .CDR, .EPS and .PNG. The icons were created by using CorelDraw 11 and export to Illustrator. This free icon pack contains 10 social media icons that you can use in websites, blogs, web interfaces, and any other work, commercial or personal. The theme is inspired by the Adobe Creative Suite logos. The set contains 24 icons, in four varied styles (square, circular and light & dark rounded corners), come in five sizes (from 512px to 16px), and comes packaged with the AI, EPS and PNG versions. These dark colored Social Network button are suitable to use on a rather dark colored website. It consists of 18 buttons of the most popular Social Network icons. A new free icon set consists of 25 icons, in 4 colors (pink, blue, grey & green), in 48×48px and 60×60px resolution. This PSD freebie includes icons Facebook, Twitter, RSS, Design Bump, Dribbble, YouTube, Blogger, Pinterest, LinkedIn, Vimeo, Deviant Art, Instagram, Behance, Last FM, Google+, Flickr, Forrst, HTM5, Picasa and Stumble Upon. Icons are vector shapes and can be resized as you like from the PSD file. They come also in transparent PNG format (50 x 50 pixels) so you can start using them right away. This social media icon set is created in Illustrator CS5 and contains 25 scalable vectors complete with semi-transparent shadows for use on various types of backgrounds. The download contains a .zip file with the original .ai file and an .eps version as well. Icons are available for use in personal and commercial projects. This very useful set is comprised of 22 social icons in vector mask layers on one practical psd. The vector icons are crafted in perfect pixel from 12×12 to 32×32 px. A set of 40 classy dark social icons in 32×32 and 64×64 px. They come with their hover state for some striking effect. Ideal to complement any minimalist dark theme of your own. Open the psd file to pick the one you want and easily modify them for your project, or use the prepared png icons. A set of 16 flat inspired social icons in a psd file. The icons follow the new trend of long shadows that make them pop from the background. Edit the psd and add more icon shapes according to your needs. These are free set of 20 social media icons that can be used in your own website and blog designs. The icons come in 32 and 64 pixels (.png files). A set of 14 wood social icons at 64x64px. Those original wood icons are ideal to bring a classic and rustic feel to your design. This would be our volume 1 of a series of woody icons. The Rise social icon set includes 14 social icons for twitter, facebook, rss, instagram, pinterest, dribbble, linkedin, skype, flickr, vimeo, digg, youtube, zerply and stumbleupon. Icons come at a size of 48px x 48px in png format, the original layered psd is also included in the download. 10 beautifully flat designed social media icons. They come organized neatly in a psd file that allows you to completely customize them the way you want. Currently they are 64 x 64 px big, but can be re-sized with the drag of a mouse. IC Mini Social Icon Set, a social icon set containing 18 icons in JPG, PNG and PSD format. The IC Mini Social Icon Set Psd is layered and fully editable. This flat social media icon set contains 16 of the most used social services with 2 variations: circular and squared which both come with color and black and white iterations. They are 100% vectored for your use in any of your projects, we have also included exported sets as 36px PNGs to make your life a little bit easier. Up for grabs is a beautiful set of social icons. This free download includes a PSD file will fully editable shape layers, plus 56 icon variations in PNG format. 35 popular social icons in 32×32 size are included in this free download. The file format is PSD and shape layers were used to allow for resizing of the the icons. The 24 icons included are rss, twitter dribbble, vimeo, facebook, forrst, zerply, github, you tube, skype, flickr, share this, digg, google+, last fm, evernote, ember, linkedin, paypal, tumblr, behance, aim, yahoo, and wordpress. The icons come in JPG and PNG format and a size of 32px x 32px. 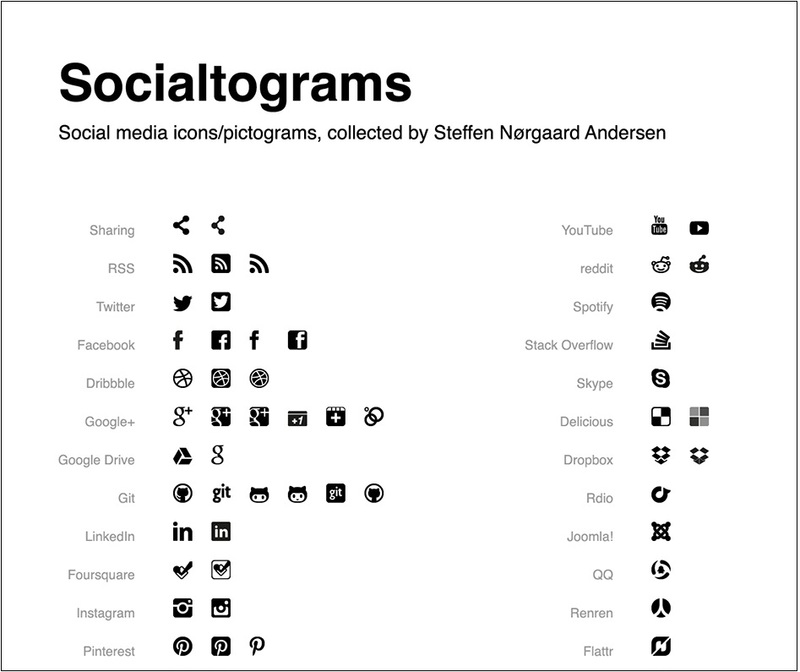 Here is a collection of social vector icons/pictograms free for you to download. – Collected from various icons packs and individual brand/logo-banks. These are 24 circle social media icons. Each icon comes in both a dark and colored version. This free download includes the most popular icons used on websites. The theme used in these icon set is worn-and-torn, so it’ll look great on grunge, vintage, classic-themed web designs. This set contains 20 200px x 200px PNG files that you can easily resize and edit for your website design. Here’s a nice simple set of Social Icons (not flat this time) in vector/resizable PSD format. There’s two different variations, if you’re into that – all exported PNGs as well. Cheers! Every icon from WPZOOM Social Networking Icon Set is available in 5 different sizes: 64×64, 48×48, 32×32, 24×24 and 16×16px (PNG & PSD format). This means you get 500 beautiful icons! This is a huge set of 1,540 social networking icons, 154 icons in 10 colors corresponding to each of inFocus’ color variations. This set is designed to be put in the sidebar of your theme so you can link to your social media profiles. Hearting Social Icon Set, a set of 22 social icons in .png and in resolutions 16×16, 32×32, 64×64. This set of free hand drawn doodle icons includes 14 graphics tailored specifically for bloggers. Including social media graphics for Delicious, Design Float, Digg, Facebook, StumbleUpon, Technorati and Twitter as well as commonly used icons such as RSS, Home, Comments, Contact and WordPress. This icon set is for those that love the traditional square icons. This set provides you with today’s most popular social media/networking site icons, in a sleek web 2.0 button design. 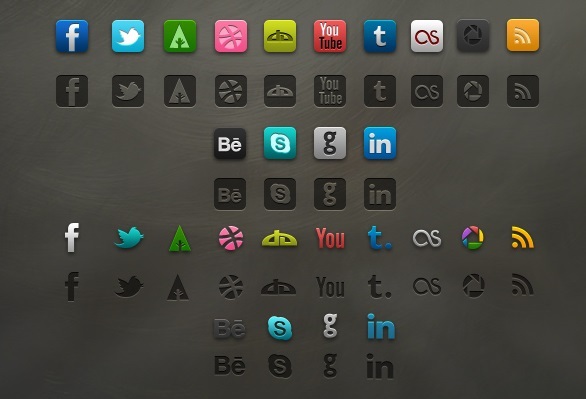 108 High Res Ultra Glossy Silver Button Social Media Icons. PNG format. Free for personal and commercial use – no attribution nec. This is a orange orb icon design, glossy and web 2.0ish. The icons range from Blogger to YouTube and include Flickr, Twitter, Facebook, and many more. There are 20 in the set, and a few have alternate styles (Del.icio.us – Facebook – Twitter – Myspace – Flickr – Digg). 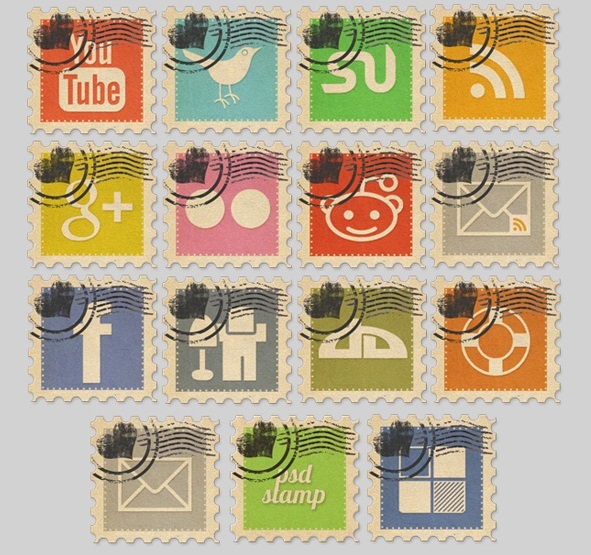 65 freeware icons of Web 2 Social Bookmarks and Networks for use in blogs, websites, etc. Coucou is a set of 64 fun and quirky icons. The icon set is called “Buddycons” and includes 126 vector social media icons. Included in the set are PNG versions of all 126 icons in both circular and rounded variations as well as a vector source file for easy resizing. Free Windows Vista icon pack for your Website or Application. 32 icons in formats PNG (256×256, 128×128, 48×48, 32×32, 16×16), ICO (256×256, 128×128, 48×48, 32×32, 16×16) and ICNS (256×256, 128×128, 48×48, 32×32, 16×16). There are a sea of social icons available for download but surprisingly very few simple flat options. So here are 12 of the most popular in square, rounded, and circle flat formats. A fun set of 28 social media icons done in a hand stitched vintage badge style.